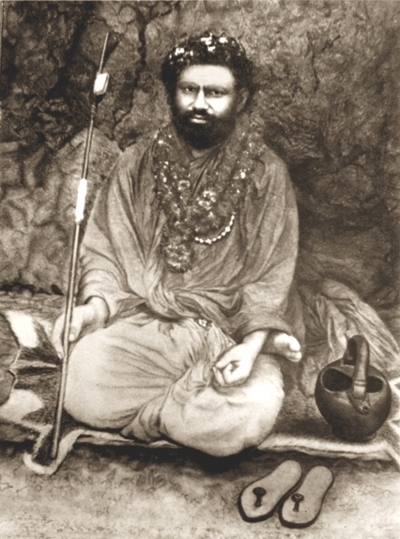 Guru Dev met his guru, Shri 108 Shri Dandi Swami Ji Krishnananda Saraswati, in about 1874 whereupon he was given the name Brahma Chaitanya Brahmachari. His guru later inducted him into sannyas at the Kumbha Mela festival of 1906 in Prayag (Allahabad), giving him the monastic name Shankaracharya Swami Brahmananda Saraswati. 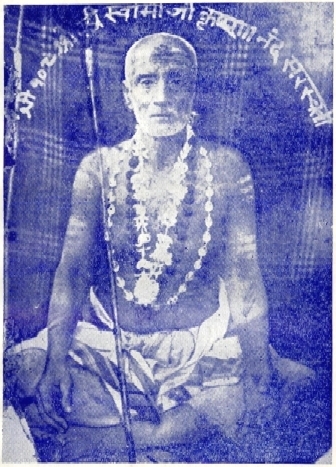 After Swami Krishnanand died, in 1936 Swami Brahmanand Saraswati set up the Swami Krishnanand Trust to administer an ashram, temple and school in Varanasi. "It is to be remembered that back in 1936, before being offered the post of Shankaracharya, Maharaj Shri had had built the Shri Brahmavidya Niketan and the Shri Brahmanandeshwar Mahadev Ji Mandir (a temple) in Choti Gaibi, Varanasi, in rememberance of his own venerable Shri Gurudeva. The beautiful appearance of the ashram and mandir (temple) etc, was made on account of the management and another major ashram in Siddhi Giri Baag, Varanasi, was built by the name of Shri Brahma Niwas. This, the two other buildings and one at Bahadur Ganj, Prayag (Allahabad) were all connected, and these properties were placed under the protection of the Shri 1008 Swami Krishnanand Saraswati Trust, whereof mention is made in Maharaj Shri’s final will." (excerpt from translation by Paul Mason of Hindi biography of Guru Dev). Swami Krishnanand had many disciples, amongst them Yoganand Saraswati, some years senior to Guru Dev. "The glory of the Upanishads lies in the teachings on non-duality found in their pages." it is only a God-favoured man who studies the doctrine of non-duality." "Those who serve their Guru when his body is ill or his mind is anxious, are the true and holy pilgrims." "Purification of the self must precede service of man." There is a problem in reconciling the identities of Guru Dev's guru and that of Shri Dada, in that it is believed that Guru Dev's guru died circa 1936, whereas a representative of Shanti Sadan is of the opinion that Shri Dada's guru had likely died by 1890 (which figures if he was already advanced in years when he attended the meeting in 1855).